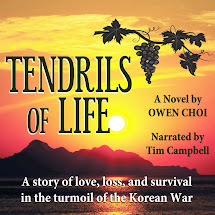 "A Gripping Tale of Living in War"
If you could sum up Tendrils of Life in three words, what would they be? What was one of the most memorable moments of Tendrils of Life? This book is about relationships – and many of them are “potential relationships” in which the parties struggle to show their true feelings toward one another, with mixed success. When Sora finally connects with Jimin, I cheered them on with a happy heart! What does Tim Campbell bring to the story that you wouldn’t experience if you just read the book? I read the book first, then listened to it. Tim Campbell’s character voicings actually helped me understand the characters much better! During the war, many people lost track of one another, and that is the subject of much of this book. As this is reviewed at the very end, it was so touching to me! I couldn't put this book down! It is a gripping tale of two feuding families in wartime Korea, and the action and plot twists just keep coming, page after page. You get to see Asian culture by participating in it, and you get to experience the many ups and downs of life in a family by living it. 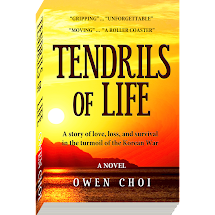 "Tendrils of Life" makes you appreciate the strong loyalty that comes through being part of a family. But most of all, this novel helps us see the day to day tragedy it is to live in a war-torn land. So many people have experienced this around the world, yet so many have never thought about how hard it really is. After reading this book, I so appreciate the relatively peaceful lives we are privileged to live!